Dunkertons Cider Co Ltd01544 388701work BreweryAt Dunkertons, making cider and perry the traditional way always begins with the fruit we select. Our drinks are made from traditional varieties of apples and pears, chosen each Autumn for their particular characteristics. As soon as apples are ripe, which in some years has been as early as September, they are delivered to the Mill in Pembridge or harvested from our very own organic orchards. The fruit is washed, milled to a pulp and then pressed by a belt press. The juice is pumped to shining stainless steel vats for fermentation. A long slow fermentation leads to more interesting flavours, so it can be late May before ciders are ready for racking off. Dunkertons likes to ferment the juice that it presses each year in its single variety form (each type of apple fermented in separate vats). The result is a wonderful selection of single variety cider from which we can craft the blend. Each of the ciders produced are distinctive in their own way and even apples of the same variety from different orchards can taste subtly different and bring something special to the blend. Tasting and blending of the fermented cider happens throughout the year to create our delicious cider. Some single varietals we keep just as they are for the cider enthusiasts like our Browns, Court Royal and Breakwells Seedling Cider. Bottling of the cider and perry takes place on the premises and some of the cider is pumped across to oak barrels in the converted 16th century barn where you will find our shop and can taste our products. Perry is particularly difficult to make, as the pears need to be pressed as soon as they are blown off in the autumn winds or fall from high branches in later frosts. Great care has to be taken after fermentation in racking off the juice from the lees to produce a bright delicate and aromatic Perry. Dunkertons use pear varieties like Moorcroft, Thorn, Merrylegs and Brandy. Dunkertons strongly believe in sustainable organic farming of the land. We love using organic apples and we think that they make the best cider. Come and see what makes cider from organic orchards special. 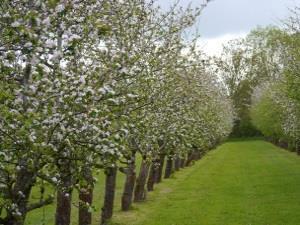 Come and taste our cider in the shop and, if the mood strikes you, walk the orchard. There is no charge for the visit. If you are a large group who would like to visit the shop please let us know in advance. There is a Café on site “The Cider Barn” please check that they are open before planning a visit to see us if you would like to book tea or lunch. At Dunkertons, making cider and perry the traditional way always begins with the fruit we select. Our drinks are made from traditional varieties of apples and pears, chosen each Autumn for their particular characteristics. As soon as apples are ripe, which in some years has been as early as September, they are delivered to the Mill in Pembridge or harvested from our very own organic orchards. Tasting FREE. Tasting is available at the shop whilst the business is operating and customers can go for a walk in the orchard.